Fitted furniture seems to be the perfect partner for bathrooms, especially if you're looking for a designer look. There is a wide variety of styles, ranging from traditional to modern, as well as colours and finishes to complement any bathroom, cloakroom or en suite. Choose from a huge range of fitted bathroom units and cabinets to create a look that's perfect for you. 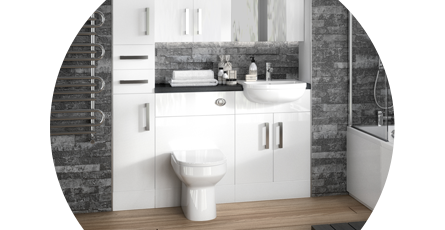 fitted bathroom cabinets sit neatly against the wall giving you plenty of practical storage options and both units and cabinets are offered in various styles including corner units; ideal for making the most of space in smaller bathrooms. All of our fitted bathroom furniture can be customised by choosing your own handles and worktops. This means that you can create a designer bathroom using our fitted furniture and won't run the risk of your neighbours having the same thing as you.